Just 4 days ago we hit a fresh new high in US major indexes. Today, we almost hit the exact same highs, isn't it? So why is this piece titled "breakdown"? To start with, since the March lows, almost all world markets have participated in this impressive rally. But some are starting to show strong signs of fatigue. Japan is one of the biggest economies in the world. EWJ (The Japan ETF) has peaked on Sept 11, 2009 at 10.38, more than 2 months ago. This 10.38 peak now looks very much like a long-term top to me. Today, the Japan Nikkei index has hit a fresh 4-month low. EWJ is now lower than it was in August. OK, that's Japan you say, what about the U.S? 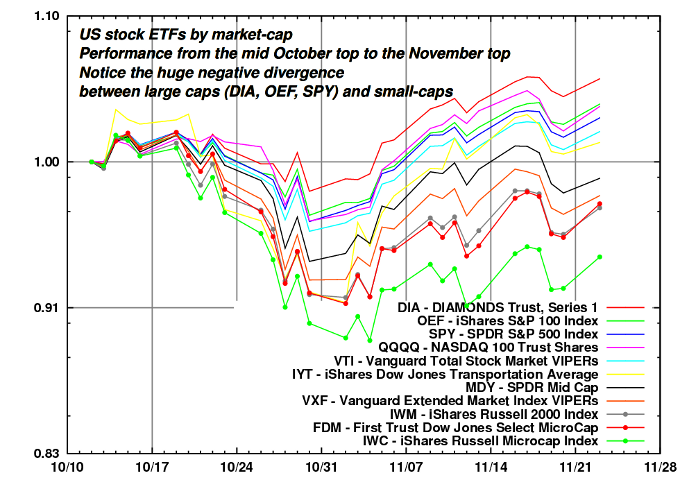 The following image showing the performance of U.S. stock ETFs from the prior intermediate top (mid October) to the last intermediate top (November). Notice how a major part of the market: essentially all small and micro-caps, and to a lesser degree, mid-caps, have not confirmed the recent-top in the large caps, despite their higher betas. The ETFs are listed from top to bottom by size, and the charts are almost in the exact same order: the smaller the market-cap, the bigger the negative divergence. Since this picture is worth a 1000-words, I'll be very brief. I think everyone should study it, and get defensive before it is too late. Here's your chance to get out at the top.